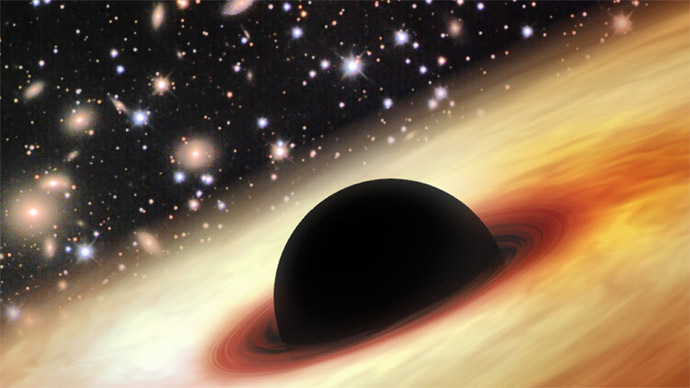 A gigantic black hole has been discovered with an astonishing mass 12 billion times bigger than the sun’s. Its age – it was formed 900 million years after the Big Bang – undermines modern scientific theories. The new “object,” dubbed SDSS J0100+2802, was found 12.8 billion light years from Earth at the center of a quasar – a core element of a galaxy that emits radiation – with a million billion times the sun's energy output. The results of the finding by an international team of astronomers were published in the journal Nature on Wednesday. The black hole was formed right at the dawn of our 13.8 billion-year-old universe, and was called “the brightest lighthouse in the distant universe” by Xue-Bing Wu, the leading author of the paper. What astronomers find unexplainable is the fact that such an enormous black hole was formed following the first stars and galaxies, which contradicts theories that black holes are formed while sucking in celestial objects nearby. The team of astronomers from China, the US, Australia, and Chile were studying materials obtained by several telescopes from all over the globe, when they found the brightest ever quasar with a black hole, with a “redshift” of 6.30. The “redshift” is a way to measure the distance and age of an object emitting light by the stretching of light to the red end of the spectrum. Quasars exceeding a “redshift” of 6.0 are extremely rare – only 40 of them have been discovered so far. “Our finding of an ultra-luminous object with a mass of 12 billion times than the mass of our Sun in the early Universe is a surprising discovery. Before our work, there is no black hole with so huge mass within 1 billion years after the Big Bang. That makes our discovery unique and important,” Wu told RT. Mysterious quasars were discovered in the 1950s. For the time being, scientists have counted over 200,000 quasars, which are extremely difficult to find. They are believed to consist of heated matter, surrounding supermassive black holes that can be found in the center of galaxies. The black hole in the center of our Milky Way galaxy has a mass of three million suns. “This quasar is a unique laboratory to study the way that a quasar’s black hole and host galaxy co-evolve. Our findings indicate that in the early universe, quasar black holes probably grew faster than their host galaxies, although more research is needed to confirm this idea,” co-author Yuri Beletsky from the Carnegie Institution said.